A mounted blaster cannon appeared yesterday but currently lacks a suitable minifigure to hold the hand grips such as a Clone Trooper, a Rebel Trooper or a Stormtrooper. 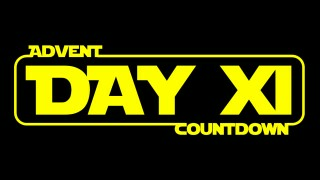 Perhaps another minifigure will emerge today. Rowan Freemaker is not necessarily the kind of minifigure that I was expecting! This character originates from The Freemaker Adventures and has only previously appeared in 75185 Tracker I, wearing this attire. 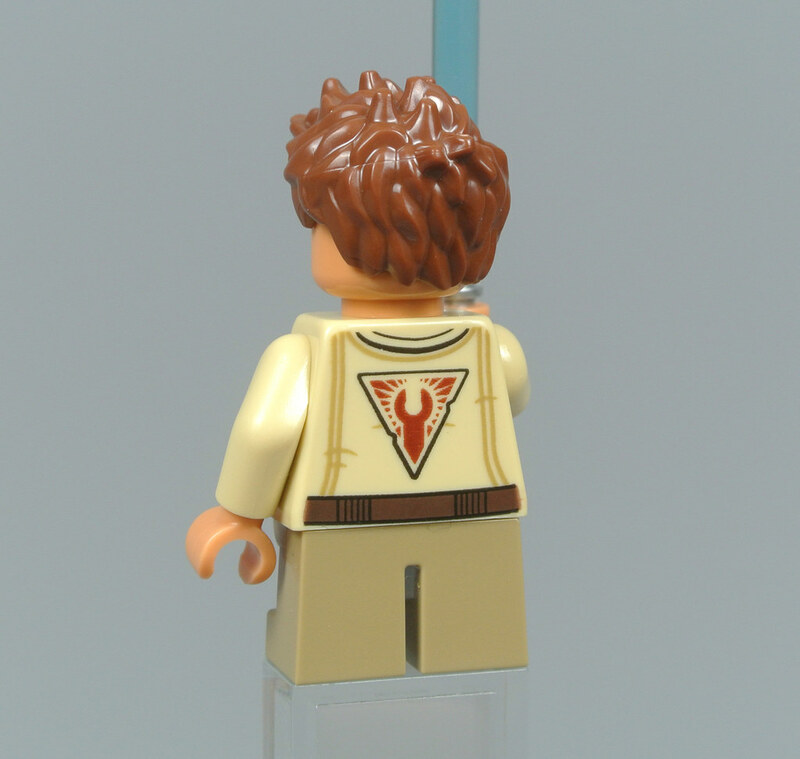 On that basis, Rowan will probably be new to many LEGO Star Wars fans and the minifigure looks pretty good in my opinion, especially on the back of the torso where the Freemakers' emblem is printed. Unfortunately, the minifigure lacks a double-sided head, instead featuring a single confident expression which suits Rowan's personality. 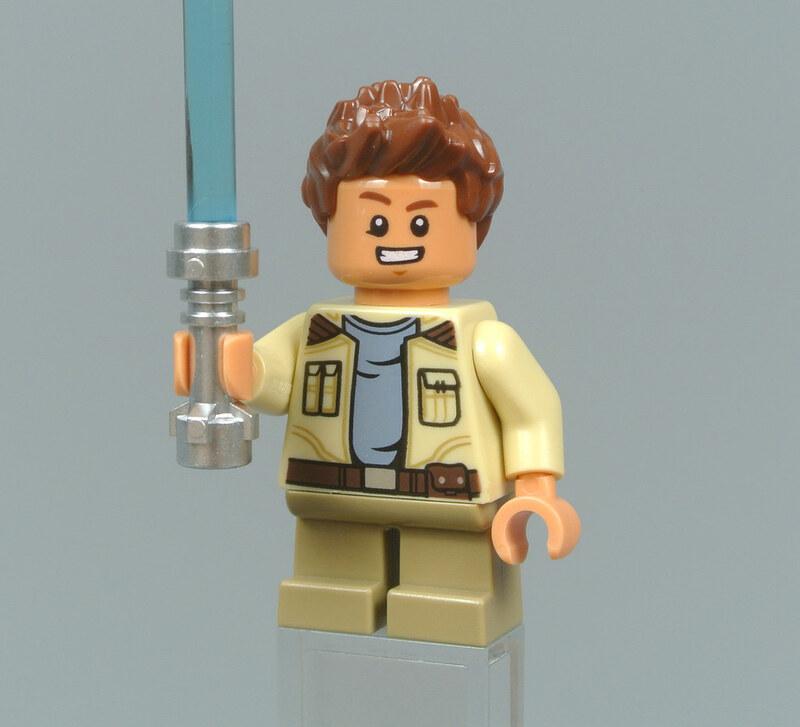 He is equipped with a blue-bladed lightsaber, matching the character's appearance in the second season of the animated series. Overall - 4.0 - This is another rare minifigure and I imagine it will be new for many people, although gifts based upon The Freemaker Adventures are not as appealing as those from the movies. You see Rowan Freemaker, I see a torso to use on a sweet Anchorhead Biggs. I placed day 2 girl beside the blaster cannon, and today's gift beside that beverage holder gift on the playmat. They are really branching out this year! Freemaker...never heard of it.....what is that about? The Freemakers Adventures is a collaboration between Lucasfilm and Lego to produce an animated series with original content specifically for Lego Star Wars. I was really surprised recently to learn that at least some of the characters and events of LEGO Star Wars: The Freemaker Adventures are seemingly canon, since the book http://starwars.wikia.com/wiki/Star_Wars:_Droidography describes/depicts non-LEGO versions of the characters R0-GR (who narrates the book) and M-OC. That's really neat to me, since I think it's the first example of characters created for LEGO Star Wars media being adapted into non-LEGO Star Wars media. I've enjoyed the Freemakers LEGO original content. They're family story now spans three generations and is interwoven into early Rebellion through to First Order timelines. The newest series they've appeared in (after The Freemaker Adventures) is the LEGO Star Wars All Stars series, which has been really funny and interesting in connecting stories, events, and characters together. Wouldn't mind this version of little Rowan, although I ended up not pulling the trigger on this years' SW Advent Calendar, thus ending my tradition of collecting all the previous ones. Still unsure if I made the right call or not, (that's why I keep curiously checking this article lol), and if I find one on discount may still have to pick it up. Couldn't care less about the Freemaker Adventures. Like @JonMarten said, torso might look good on a different fig. I'm thinking a generic rebel but the logo on the back is maybe a bit too distinctive. Whats not to love about this minifigure! I am well impressed with the contents of this calendar thus far. Who the heck is this kid? @JonMarten, Brilliant! This torso is perfect for Biggs, especially since he has a cape that would cover the back side. I have never watched The Freemaker Adventures, so tonight's build isnt as memorable. Nevertheless a nice fig and at least there's a print on the torso rear. I'd been buying two per year (one to build, one for parts and minifigs), but last year's was a hard pass for me. I haven't bought this year's at all, but I'm debating that choice. No regrets for last year, though. @Purple Dave, maybe it was last years' that broke me lol.